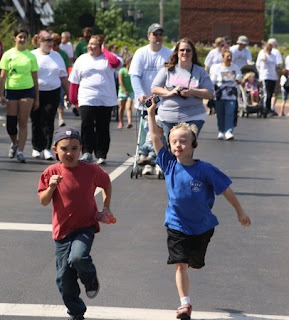 When Nancy Gianni, the founder of Down Syndrome awareness center Gigi’s Playhouse and her busy team of volunteers first organized the 5k Fun Run and Dash for Down Syndrome in 2003, they had no idea of the success it would lead to. If the cheering from the audience was any indication, than three thousand walkers and runners in next year’s event sounds about right. The funds from the eighth annual event will not only help support the continued growth of the different Playhouses in operation, but also the 26 different therapeutic and educational programs that is offered to children with Down Syndrome at each Playhouse location. Gigi’s Playhouse, which first began in Hoffman Estates, has seen some exciting growth since its inception in Gianni’s basement eight years ago. Not only did they begin an annual event that brings tremendous support from the community and local businesses to help the center’s fight for awareness of Down Syndrome, but the Playhouse has grown to nine locations scattered throughout the Illinois and even the United States. Gianni says there is even more growth on the horizon. Both Gianni and Von Tobel credit the growth of the event, and the various Gigi’s Playhouses, to the amazing effort from the community. The inspiration for the 5k Fun Run came from a mother that hoped to enter a marathon race with her daughter, who is afflicted with Down Syndrome. but was unsure if she would be able to. Gigi’s Playhouse helped make that dream come true for the mother by instilling self-esteem and easing some of the fears associated with Down Syndrome. Gianni and Gigi’s Playhouse decided to host the 5k run that has now become an annual event. Perhaps it seems that one of the most important things children with Down Syndrome can do, is inspire. They have inspired a Playhouse, an event and now a community to action.